SHEFFIELD, Vt. -- Sheffield Federated Church is an austere place. It has high-backed wooden pews and not so much as a spire for ornamentation. Its parishioners are a stern bunch with an aversion to verbal flourishes and emotional outpourings. The ways of old New England seem inlaid in its white clapboard casing. But on a recent Sunday morning, a man from Mississippi ascended to the pulpit. In a booming drawl, he preached of salvation through the acceptance of Jesus Christ. He marched the aisles and sang along to a rollicking gospel recording. At the end, he exhorted the congregation: "Everybody hugs necks with somebody." And after a moment's pause, the congregants jettisoned Yankee reserve and embraced one another. Pastor Tim Pittman is part of a wave of Southern Baptists transforming New England religious redoubts. In towns across northern New England, they have arrived to minister to churches without pastors in places where dwindling congregations has meant shrunken church funds. The Southern pastors come with missionary zeal, a willingness to work for a pittance, and a conservative philosophy notably different from the more liberal New England religious tradition. Their arrival marks the melding of cultures that have been separate since the time of the Civil War, when Southern Baptists broke with their northern brethren. And yet Vermonters -- to the surprise of the Southerners and themselves -- have embraced Pittman and others, warming to their manner and message. "It's hard for Vermonters to accept people from outside the area, much less the South," said Lucille Nelson, a parishioner at Sheffield Federated. "And he does have a very different style. But he is just awesome. He talks to us at our level. Not like he is higher than us. "And the people in the back row," she said, "they can hear him." Southern Baptists have had success gaining adherents in recent years outside their traditional base of operation in the South. The denomination has made inroads in southern New England, largely owing to its recruitment of immigrants from Latin America. But its reach into northern New England, specialists say, is remarkable since the region has long been considered one of the least religious in the nation, second only to the Pacific Northwest. "From their perspective, it is a brilliant idea. You have a lot of these communities that are dying," said Randall Balmer, a religion professor who specializes in evangelicalism at Barnard College in New York. "And they are swooping in and saying, 'We'll provide you with clergy and reflag it to be Southern Baptist.' It's brilliant." There are at least a dozen mainline Protestant churches in Vermont, Maine, and New Hampshire where Southern Baptist ministers have assumed the helm. Southern Baptists say they don'tkeep an official tally. Vermont has seen the strongest incursion of Southern Baptist influence. The denomination's organization there is strong; it has assigned a full-time staff member to coordinate the nearly 1,000 volunteers recruited from across the country who annually assist needy churches with such improvements as painting, digging wells, and building handicap-access ramps. "What has happened is we have taken our place at the Christian table," said Terry Dorsett, associational missionary of the Green Mountain Baptist Association. Vermonters have taken notice. "The Southern Baptists are concerned about the little churches," said Wilbur Beer, who attends the Sheffield church, where Southern Baptists installed a bathroom and repaneled the foyer. "They help people out and I like that." Southern Baptist leaders are quick to emphasize that their focus remains on creating new churches, not usurping existing ones. "We are not looking to take a church from another denomination," said Jim Wideman, executive director of the Baptist Convention of New England. Pittman, 45, arrived with his wife and son six years ago after hearing from a colleague that the church had no pastor. He accepted the $5,000-a-year job, along with another position heading a nearby Christian school. A native of Iuka, Miss., Pittman had never traveled to New England before his move to Sheffield, a town of 700 residents not far from the Canadian border. Culture shock followed. "I went into Wal-Mart withdrawal," said his wife, Linda. No one knew quite what to make of the new preacher, with his Southern sayings and casual -- almost whimsical -- preaching style. Pittman has since won the loyalty of the Methodist congregation, which numbers about 40. Many note the levity he brings to services and the disarmingly clear path to salvation he presents. "Folks, I am on a program," Pittman preached on a recent Sunday. "I will read the Bible about seven times this year. I've already been through it once. It don't take but 180 minutes a day." Pittman says he goes easy on the theme of sin in his sermons. New Englanders do not abide that as well as Southerners. Nor do they embrace the idea of missionizing, an idea contrary to New Englanders' traditional resistance to outward shows of religious belief. But Pittman says evangelism is a core tenet, and he seeks to impress its need upon his congregation. On a recent Sunday, Pittman held a revival at the church. He was joined by a colleague, pastor Craig Carlisle of Decatur, Ala., who had traveled to Sheffield for the event. Together, the men preached about the virtue of spreading the Southern Baptist message. "We are under attack today as Christians. To take a stand takes courage," said Carlisle. "Do people know you are a believer in Jesus Christ? Do they know there is something different about you but they can't quite put a finger on it? You can tell them it's because of the hope you have in Jesus Christ." "My prayer is that if you are a believer, your fire will burn bright, and you will make a difference in your community," he said picking up a Bible and hoisting it over his head. "Whatever you do -- let Christ shine through in your life!" 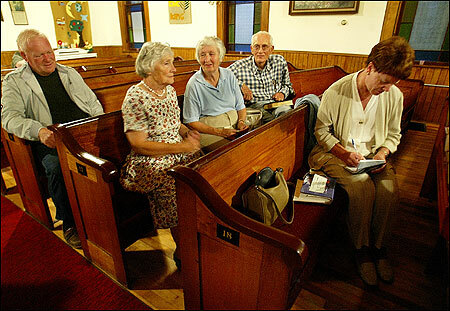 In the sturdy little church on Route 122, the congregation listened, rapt with attention. Afterward, David Westcott, 49, a hardware salesman raised in the Congregational tradition, said the message was at once soothing and exhilarating. "It's comforting to hear that we're all in the same boat," he said. "That we're all sinners." Asked if he would spread the word, Westcott thought a moment. "Well," he said, shaking his head, "I'd have my reservations with that."